With the train loaded and already moving down the tracks, we better get on with releasing our next set of prospect notes. Over the past two weeks, we’ve already published info on more than a dozen Honorable Mentions – including Aiden Dudas, Mikey Eyssimont, Cole Hults, Nikolai Prokhorkin, and Bulat Shafigullin – here. Then, our first look into the Top 10 included detailed scouting reports on Daniel Brickely, Sheldon Rempal, and Matt Roy (here). 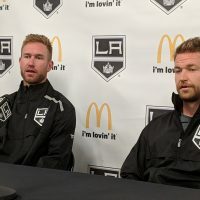 For those catching up, this article is the latest in our annual multi-part series, where we pass along key insights on potential future members of the LA Kings NHL roster. 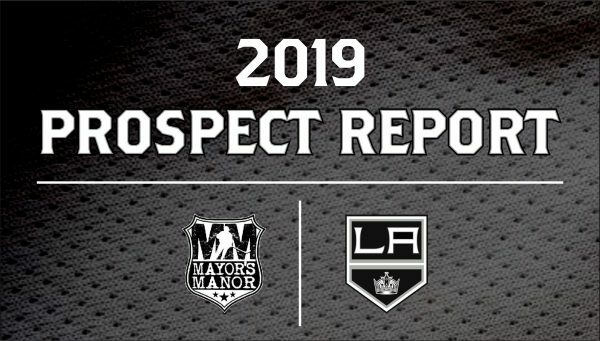 If you’re unfamiliar with our rankings, for nearly a decade this content has become a vital source of player information, as nobody outside the Kings organization talks to more coaches, scouts, and General Managers about LA’s top prospects on a regular basis than the team at MayorsManor. Endless hours go into evaluating players in the Kings pipeline and preparing our write-ups. Additionally, the final slotting of players is influenced by hundreds of hours of game action and debating the team’s prospects with a myriad of well-respected hockey people, including our key sources inside the team’s front office. No other prospect on our list this year has a story quite like Phillips. Many reading this are already somewhat familiar with the 6-foot Toronto native because of his recent stint with Team Canada at the World Junior Championships. Although, he didn’t travel the linear path normally associated with a player put in such a pivotal role for that star-studded group. Yes, growing up, Phillips was a top player throughout various age groups of his younger hockey career. He previously had represented Canada at the 2016 Under-18 World Championship and even served as captain of Team Canada at the 2016 Ivan Hlinka Memorial Tournament. However, all of that occurred when he was a puck-moving defender, further evidenced by the 43 points he posted in the OHL during his draft year, followed up with a 39-point campaign last season. One year ago, Phillips would have been considered a mid-round NHL pick playing like a mid-rounder; and that’s not a knock, there just wasn’t much to get excited about when projecting his future as a pro hockey defenseman. Additionally, Phillips’ previous success would have naturally led him to believe he was a certain type of player. Then, the Kings development staff got a hold of him and turned his whole world upside down. What could have created a serious identity crisis instead has turned into as remarkable of a tale as you’ll likely ever hear when discussing an NHL prospect. LA’s staff, largely lead by Mike O’Connell, was able to identify Phillips’ specific set of skills that should lead to success at the pro level. In brief, they didn’t see him as an offensive threat on the power play. Rather, their vision involved him being the complete and total opposite, a shutdown defenseman. Now, it’s one thing to identify it. It’s another thing for Phillips to accept it and run with it – which is exactly what he did. Further, the timeframe in which he transformed his game is beyond remarkable. Phillips completely reinvented himself in little more than a summer and half-a-season, also moving himself from being a lower-tier prospect to a higher-tier prospect. During the process, he went from somebody many considered a fringe selection to Canada’s WJC summer evaluation camp last August, to starting on their blueline just four months later. NHL scouts here continue to rave about the play of LA Kings prospect @mphillips_18 (Team Canada). Saying the defenseman has morphed into the beat version of himself. Has really elevated his game/stock. When talking to those inside Kings management circles, many rave about what has already been accomplished. Phillips received the right type of direction, the right type of encouragement, and the right type of teaching. Even so, he also had to be the right type of kid to take the information and do something with it. “It’s not something a lot of 19 year olds could accept and buy into,” one person noted to us during the preparation of this year’s rankings. His tale is far from completed; heck, even his season is far from over. Soon after returning from the WJC in Vancouver, Phillips was traded by Owen Sound (his team of the past three-plus seasons) to Guelph, who are loading up for a shot at the OHL championship and a possible Memorial Cup run. His role there is somewhat in flux, as he’s moved from seeing top-pairing minutes with the Attack to anchoring the Storm’s second pairing alongside Toronto Maple Leafs draft pick Fedor Gordeev. Phillips is expected to be counted on as a physical, defensive-defenseman for the balance of the season, with his contributions on offense often limited to quick breakout passes, lots of shot attempts, and the occasional zone entry with speed. With Guelph, Phillips is being deployed in late and close situations. Given the team’s run-and-gun style, Phillips and his partner can be faced with an abundance of chances against, putting an onus on Phillips to do less puck rushing and focus more on his positional play. Playing a safe yet mobile game, centered on retrieval and transition, is what should be expected from the left shot Phillips when he graduates from major junior. 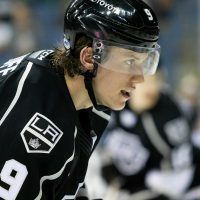 The Kings are counting on signing him to an Entry Level Contract prior to the June 1st deadline. He is targeted for AHL Ontario next season. For everything that went right with Phillips and Team Canada in 2018, Thomas has faced the exact opposite situation over the past six months. He was a first-round caliber player last year, leading many to believe the Kings got a steal in Thomas. 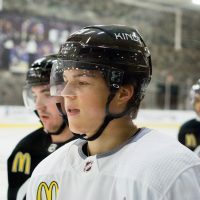 Then, over the summer, after initially not being invited to Team Canada’s evaluation camp, he caught what at first looked to be a break when it was announced fellow Kings prospect Gabe Vilardi was skipping the event to rest his back. Thomas, even though he was just 18 years old and Canada typically fields an older team for the annual international prospect showcase, was added to the list of camp attendees. However, he ended up being injured during practice, never really getting the opportunity to show off his skills. Make no mistake about it, though, Thomas is an elite talent and one who would normally be ranked higher on our list, except for one thing – he’s a ways away from being NHL ready. Having just turned 19 a few weeks ago, the (somewhat) Florida native is developing quite nicely in the OHL. Thus, there are no reasons to be concerned by his developmental timeline. It’s simply par for the course when dealing with young players; they all grow and mature at a different pace. After a ridiculous offensive production last season, and leading his team with 81 points, Thomas hasn’t shown any signs of slowing down this season. As of this writing, he’s posted 73 points in 45 games (and already surpassed his goal total of last season, 26 to 22). Better yet, all of this has been done after he missed several weeks in November due to some lingering problems from the injury suffered at Canada’s summer camp. During that break, he traveled to Los Angeles to meet with team specialists and complete his rehab. Perhaps it should have been obvious something was off in the months prior. Prior to opening his OHL season, Thomas participated in the 2019 NHL Rookie Showcase event in Las Vegas. To say it wasn’t his best showing would be an understatement. As one NHL scout put it to us, “He was a total non-factor, which is worse than just being bad. When you’re good or bad, at least you’re involved in the play. He was neither, often on the outside of what was going on. He was invisible.” Now, in fairness, this can be fairly common for very young prospects during their first NHL Rookie Camp. Take Vegas first rounders Cody Glass and Nick Suzuki. Both could easily be described as non-factors at the 2017 tournament and nobody is complaining about either player these days. In fact, Glass was an absolute stud just one year later at the aforementioned 2018 event. It’s not unusual for a guy to come into a Rookie Tournament and be a non-factor. If it was easy, everybody would jump off the page. We expect Thomas will be just fine too. After getting off to a lukewarm start, posting just 8 goals in his first 17 games – including zero points in six of those contests – Thomas spent a few weeks in LA, as noted. Upon his return to the OHL, he put up 15 points in his next 10 games. In January he went a streak of 21 points in 8 games. He’s had only four games in 2019 without a point. And that’s what he’s working on, finding that offensive consistency in his game. A player of his talent should be on the scoresheet almost every night. Going two games in a row without a point should be an extremely rare situation. He’s just one of those players who usually finds a way to score or create a scoring opportunity. Thomas is aware this needs to be his focus, and those conversations have already happened with Kings management. More importantly, LA brass believes he has what it takes to make an impact at the NHL level. He simply needs to keep adapting. He’s outstanding in all facets of the game right now except his consistency. It should be pointed out that players don’t get these types of points in the OHL by accident. Thomas isn’t sneaking up on anybody this season. It’s just about doing it game in and game out. He’ll go on a run for a week or two and then go silent. Yet, there’s more to Thomas’s game than just stats — he is an incredibly cerebral player who can stickhandle his way out of any jam. The thing is, Thomas knows where to carry the puck and is one of the better players in major junior at exploiting open ice with more than just speed. Lots of kids put up points in junior leagues, but Thomas is on an upward trajectory, as a multi-purpose forward who can serve as a playmaker or a finisher. He tends to be more of a set-up guy, though. Over the past month, largely due to injuries on the Niagara roster, Thomas was playing up to 30 minutes a night, something that should normalize over the balance of the season. 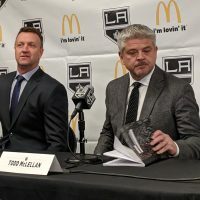 The Kings have sent in several of their staff, including GM Rob Blake, to see him multiple times during the 2018-19 campaign. They’re keeping a very close eye on him and like what they’re seeing thus far. His stats are more than acceptable, on par with what the organization had hoped for this season. He’ll need to work on improving his strength this summer, something that was clearly lacking back at the tournament in Vegas. Combined with the consistency discussed above, these are things that are 100% in Thomas’ control. Thus, his ultimate destiny and potential are in his control. That isn’t the case for the majority of prospects drafted each year. His outlook should only continue to get brighter. Like Phillips, Thomas currently plays on a loaded team that geared up for an OHL title run via several big trades. He has played on both the wing of Ben Jones (Vegas prospect) and centered the IceDog’s second line, often flanked by projected 2019 NHL first rounder Phil Tomasino or future Dallas Stars sniper Jason Robertson. Thomas is strong on faceoffs, plays on the top power-play unit and also kills penalties. Regardless of what happens during the remainder of his junior season, this coming summer will be all about strength and conditioning training, improving puck protection, and advancing his faceoff skills. Not yet signed to an NHL Entry Level Contract, look for Thomas to return to the OHL next season and then be in the AHL mix beginning in October 2020. He is the best prospect in the bottom-half of our Top 10 list and with his elite talent should be ranked much higher next time around. Good info. Is Phillips a left or right shot defensmen? Also, if Thomas plays wing, right or left? Phillips is a left shot.